Chichester City suffered a SCFL premier division setback with a 3-2 loss at Newhaven. Boss Miles Rutherford and assistant manager Graeme Gee were without a number of key players. Dave Herbert and Kieran Hartley both began three-match suspensions following red cards against Windsor in the FA Vase and Connor Cody and Gicu Iordache joined Dan Hegarty, Lorenzo Dolcetti and George Way on the injury list. New signings Charlie Osborne and Josh Dean were given starts and Josh Clack moved up top in place of Scott Jones, with Rob Hutchings employed behind him as City returned to league action after three successive cup matches. 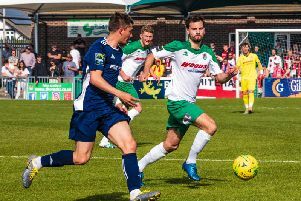 The hosts, who beat Chi by the same scoreline in the corresponding fixture at the Trafalgar Ground last season, got off to a flyer inside 30 seconds when Chichester failed to clear their lines and Freddie Beale turned the loose ball in. Three minutes later Jordan Matthews did well to prevent the Dockers from doubling their lead as Kyle Woolven tried his luck. Clack had the ball in the back of the net at the other end only for it to be ruled out by a linesman’s flag. Chichester had to deal with balls over the top towards league leading marksman Lee Robinson along with Rhys Smith’s long throws. Matthews got off his line smartly ahead of Robinson to one of these before a timely tackle from Ellis Martin cut out danger in the box. The visitors struggled to find their usual cohesiveness and went further behind from the spot in the 23rd minute when Matthews fouled Callum Connor and Robinson tucked his penalty kick away. Ryan Peake had a header saved by Newhaven keeper Jake Buss connecting with a Martin set-piece. Beale then rifled the ball in just before the half hour but he was judged offside. Three minutes before the break Clack gave Chi a lifeline with a low shot on the turn after a good passage of play. Who will Chi City face in the Sussex Senior Cup? Five minutes into the second half Kaleem Haitham gave Buss something to think about following nice work from the ever consistent Matt Axell. Martin set up a chance for Hutchings before Osborne fed Haitham who cut inside only to see his shot diverted for a corner. Beale had a drive charged down and Peake did well to intercept a pass that might have sent Robinson away. Axell blazed one over and Clack almost got on the end of a super knock from Ben Pashley. Matthews managed to gather under pressure from Robinson before Clack nearly capitalised on a mistake at the back. Chichester then lost possession chasing the game with 15 minutes to go. Seb Saunders made the most of this and threaded a pass into Robinson’s path. The Newhaven striker pushed the ball past Matthews and slotted it into the empty net. Robinson, who hit a hat-trick at home to Chi last year, almost repeated the feat late on but his chip over the advancing Matthews came back off the bar. A tidy finish from Haitham, latching on to a square ball from Clack, set up a tense final few minutes. Rutherford pushed centre-back Peake up front as City went long. A flick towards Clack was just too close to Buss and then the Dockers keeper managed to deal with a free-kick as the visitors threw everyone forward, including Matthews in the dying seconds. The loss and Horsham YMCA’s 4-3 win over Uckfield means YM leapfrog Chi at the top of the division. Newhaven, who have lost only one game in the league since an opening-day defeat at Oaklands move up into third spot, two points behind Chichester. City return to cup action on Tuesday night when they entertain Mile Oak in the quarter-finals of the Peter Bentley Cup before Lancing visit on Saturday for a league match. Chichester: Matthews, Dean, Martin, Axell, Peake, Pashley, Clack, Osborne, Haitham, Hutchings, Ndlovu. Subs: Rutherford, Wallis, Anders, Callnon.